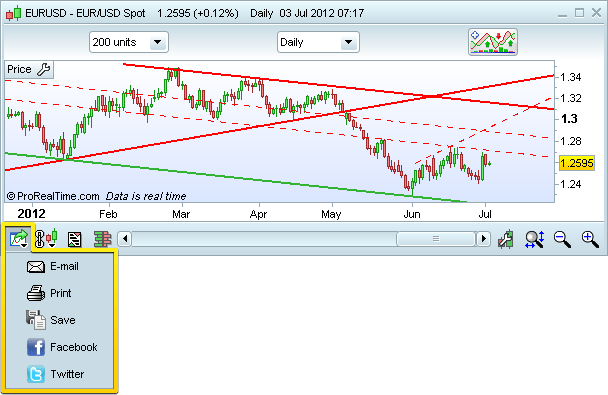 ProRealTime version 10 delivers many new features to make trading easier and more enjoyable. Learn more about why we consider it to be the best version we have ever made. The new window interface introduces several features for a better user experience. 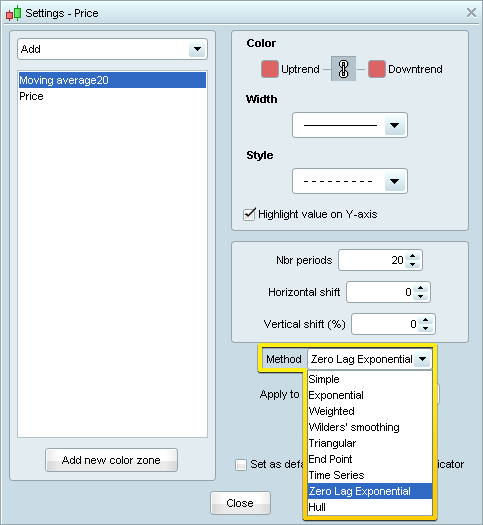 You can now transform your backtests into automated trading systems that can place orders for you even while the workstation is off. 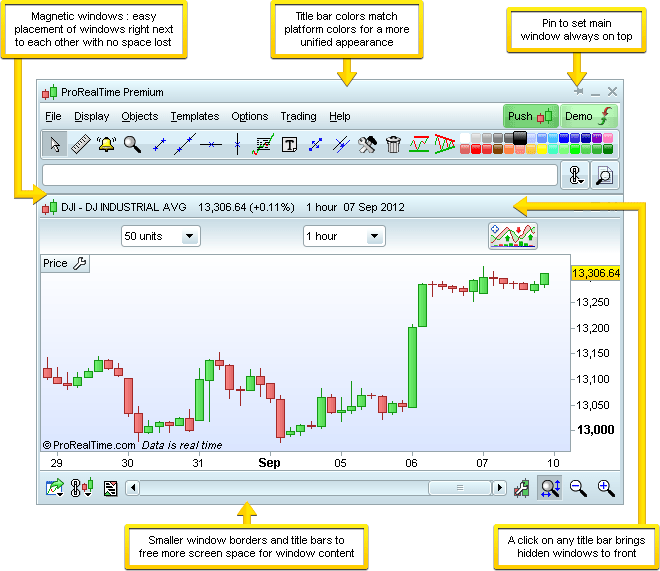 To get started, go to the "Trading" menu and open the "ProOrder AutoTrading" window show below. Instructions to start automated trading are given directly in the window. Server-side backtesting improved backtesting speed, performance and reliability and also prepared the application for automated trading introduced in version 10.1. This version introduces improvements to backtest handling and performance. 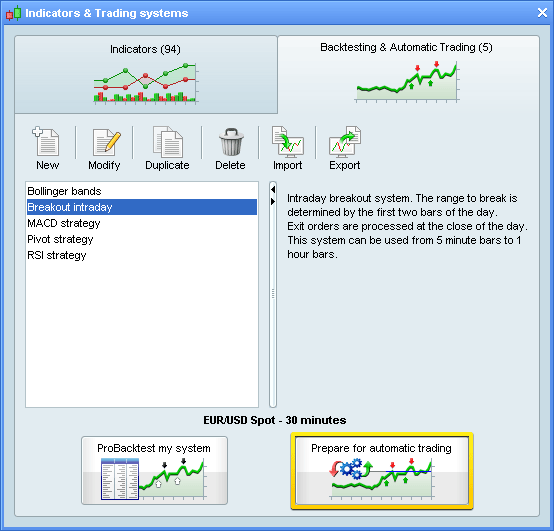 Several instructions and constants have been added to enhance trading system programming. Some instructions have been modified or removed to ensure compatibility between the backtesting module and automated execution of trading systems in real-time introduced in version 10. For additional details, please see the Trading system programming changelog. You can now view up to 150 000 units of historical data in intraday views with the Premium version of ProRealTime. The application now takes full advantage of multi-core processors for indicator calculations which results in faster loading of charts. Data processing methods were improved to allow faster display of charts and indicators to use less memory. New buttons have been added to allow you to export and import codes including your personal indicators, ProBacktests, automatic trading systems and ProScreener market scans. This is very useful to share programs with friends, post them on forums or save a backup copy on your local computer. None (default): The code is fully editable after import. Code not modifiable after import, only one import allowed for the exported file. 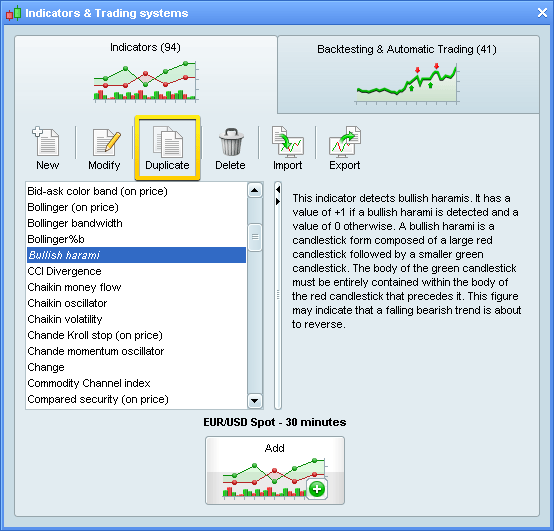 The indicator, trading system and ProScreener management windows have been redesigned and have several new features (including import/export discussed above). 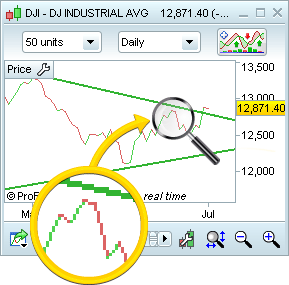 You can now add a backtest to your chart from this window, or send a trading system to ProOrder to prepare it for automatic trading. 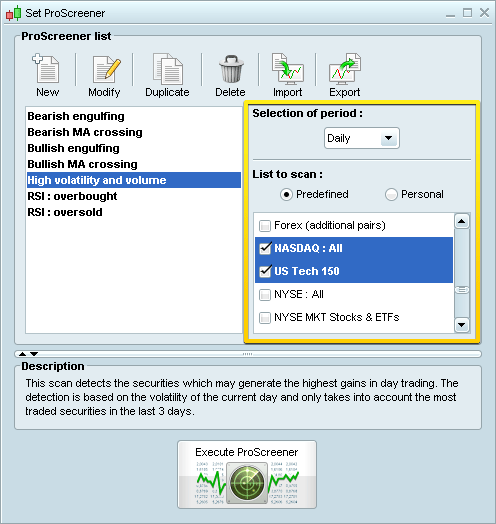 You can now change the timeframe and market of your ProScreener scans directly from the "Set ProScreener" window. 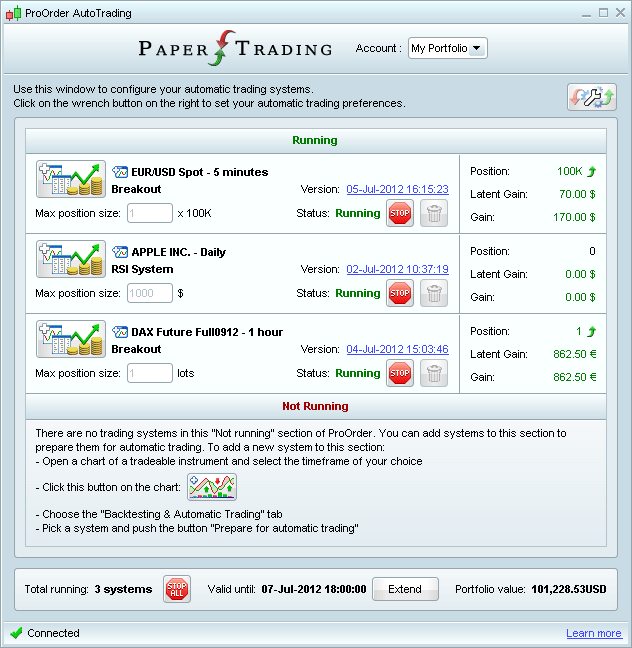 In the Premium version, you can scan multiple markets at the same time. 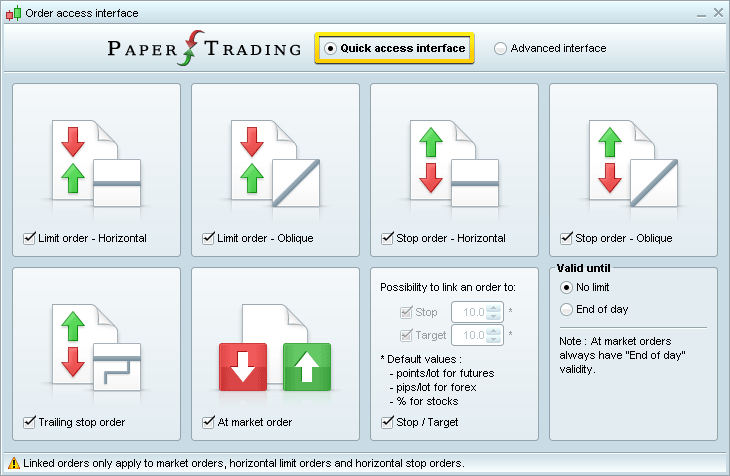 A new simplified order interface lets you place at market orders, limit orders, stop orders and trailing stop orders without the use of a dropdown menu to change order types. The previous interface which allows you to place OCO and multiple leg orders is still available too. To select the new interface, click the wrench icon shown in yellow above and select "Simple orders only". You can customize the interface to display only the order types you use most with the checkboxes. You can now place your mouse on any position shown on the chart and the application will intelligently offer you options to add target and stop orders to your positions. To add an order, simply click on the order type of your choice and then place it on the chart. The size of target and stop orders placed in this manner will be equal to the position size minus size of any existing targets or stops. Each group is identified by a color. Charting windows, order books and tick by tick lists in the same group always display the same security. 6 color groups are available in the Premium version. Multiple groups are especially useful when using multiple monitors (example: one instrument group per monitor). In the Premium version, you can link a color group to lists or the search window. Selecting a security from the list or search window will update charts, order books and tick by tick lists in the linked group with the chosen security. Remember that new charts opened with the icon are always unlinked by default. Other moving average types such as adaptive moving average, multiple smoothing moving average and triple exponential moving average (TEMA) are separate indicators that can be found in the "Indicators & Trading systems" window. Activate anti-aliasing from the "Options" menu by selecting "Colors" and then checking the box "Anti-aliasing" in the "Charts" section. his new option makes lines appear smoother. Code editor windows now contain line numbers. Undo/Redo keyboard shortcuts with Ctrl + Z and Ctrl + Y now available in code editing windows. New Find/Replace feature in code editing windows: press Ctrl + F to access it. Improved black color scheme: to see the default color schemes, open the "Options" > "Colors" window and click on the color of your choice. Additional portfolio columns available: Exposure (total), Exposure for each instrument type, Value (of each open position). 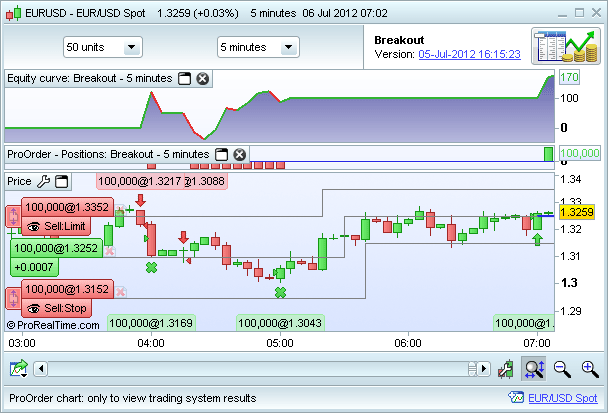 Open chart icon now available in alerts list.